Camping Au Port-Punay är en camping i Châtelaillon-Plage, Charente-Maritime, belägen vid havet. Campingen har platser med stängsel, med skugga, utan skugga och platser med lite skugga. Camping Au Port-Punay ligger i närheten av en sandstrand. Det finns möjlighet att hyra husbilar och vandrarstugor. På campingen finns en lekplats. För den sportige semestervandraren har campingen utflyktsprogram och olika cykelleder. Det finns ett underhållning. Vem vill inte efter en hård dag slappna av i en sauna, en jacuzzi och ett ångbad. Campingen förfogar över en utomhusbassäng, ett uppvärmt inomhusbad och ett knattebad. I den närliggande omgivningen kan du också simma i havet. I Camping Au Port-Punay är det tillåtet att vindsurfa. Denna inspektör gör varje år ett besök på Camping Au Port-Punay och inspekterar campingen för ca 200 faciliteter och för andra förekommande punkter. Inspektören är en medarbetare från ACSI och arbetar inte för campingen. On our arrival the reception staff all spoke fluent English and were very welcoming. Finding our pitch was easy, the receptionist cycled ahead of us so we just followed. We had a premium service pitch with water and waste water connections. The pitch is very large and could accommodate a large caravan and large awning plus 1 car. The swimming pool is exceptional, very clean and refreshing with plenty of sun loungers. Outside the site, there are some local restaurants and a daily market. There are two,beaches one that offers Jet-ski’s and catamaran sailing. The tide was out in the afternoon so if you like to swim in the sea bring a helicopter it goes out a very long way. Apart from that this site provides all the right ingredients for a quite family holiday in the sun, with sea air, next to a swimming pool with your motor home or caravan. This is one of our \"must visit\" sites when we take our annual holiday in France, which is usually in excess of 7 weeks. The site is always clean and well maintained. There are lots of interesting places to visit in the locality and we have recommended it to a number of friends as a site well worth staying on. Excellent campsite in a lovely area. Very friendly and helpful staff. Lovely walk into Chatelaillon from site. Best to book even in low season as it was full a couple of the nights we stayed here. Would definitely come back if in the area. This was our first trip abroad with the Mhome. The staff are very friendly and helpful, an obvious labour of love for the owners. Spotless campsite in a beautiful locale. Chatellion-Plage and La Rochelle easily accessible. We stayed here from18th August-26th.didn't intend to stay so long but the site staff and surroundings are brilliant. Shower block second to none. The owner spoke about 3 or 4 different languages and went out of her way to help us. Great festival in local town on our last weekend. Will definitely be returning. Great campsite. Flat and immaculate with lots of clean facilities. Great rides along the coast that are all flat. Bus stop for La Rochelle just outside campsite. Staff absolutely fab. Stayed here for 6 nights in june and it has got to have one of the friendliest welcomes ever, friendly and helpful, although very busy we were offered a choice of pitches both in and out of shade. facilities were very good with shower block and toilets clean and airy. Lovely area with a nice walk along beach into Chatalaillon Plage with it bi weekly market numerous shops and great seafront walk and restaurants. If you want to explore further afield there are numerous towns and villages within easy reach including La Rochelle which is well worth a visit. To sum up Great Site, Lovely people and in a nice area. We stayed here for 3 nights, and even though the weather wasn't good, we really enjoyed this site. The staff were very friendly, and it is very convenient to the town, with a lovely walk along by the coast and beach. There is a very nice pool in the site, and the toilet and shower facilities are excellent and very well maintained. Camping tranquilo con parcelas amplias. Duchas comunes que los cierran por la noche, los WC están al aire libre. Vill du boka campingen Camping Au Port-Punay eller få mera information? Det går bra med nedanstående uppgifter eller via campingens webbsida. 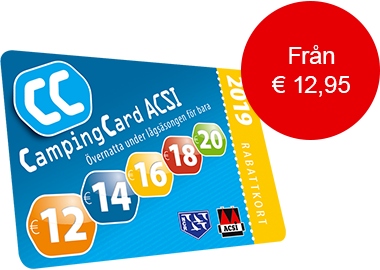 ACSI Eurocampings skickar din informationsförfrågan till "Camping Au Port-Punay".